This 4-day/3-night tour is packed with unforgettable sights and adventures. Journey aboard luxury railcar to Denali National Park and Preserve. Journey into the park on an optional tour and witness firsthand the majesty of the "Great One" or purchase one of our flightseeing or river rafting adventures. You'll enjoy every moment of this Alaskan adventure! 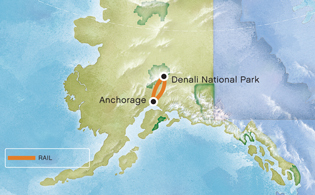 For an additional day in Denali, see Tour P2A. Enjoy a unique sightseeing experience aboard a luxury domed railcar. Take in the wide-open scenery as you travel through the Matanuska Valley, a farming region known for mammoth vegetables, and along scenic rivers like the Susitna, which means "Mother River". By afternoon, arrive in Denali National Park. Here, you can choose from a wide range of optional activities like a jet boat safari, helicopter flightseeing, or a self-drive Jeep tour. Overnight Denali-area hotel. Wake up early for an optional scenic tour of Denali National Park like a sled dog kennel tour or an exciting optional heli-hiking, fly-fishing or golfing excursion. Later, re-board the train and journey between the spectacular Alaska and Talkeetna ranges to Anchorage. Overnight Anchorage hotel.